Helping Maine’s beloved “voice of many voices” continue to reach beyond Maine. 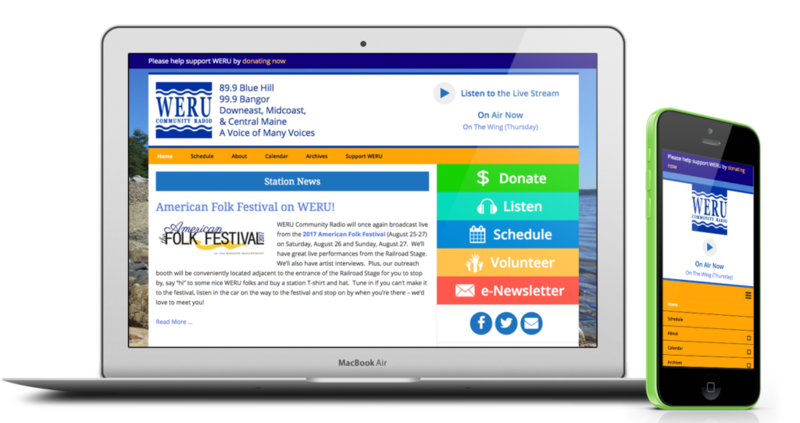 WERU-FM 89.9 is a nonprofit, noncommercial community radio station which has broadcast from its volunteer-run station in East Orland, Maine to listeners in Downeast, Coastal and Central Maine since 1988 and which has offered online streaming for many years. The station presents a broad variety of programming from music to public affairs. It’s staffed by volunteer hosts who have a great affection for community radio and it’s supported by a diverse array of organizations, businesses, and individuals. The content management system they’d been using for many years provided a complete module set designed for use by small radio stations, but it was no longer available and couldn’t be updated effectively. The site wasn’t mobile friendly and it was growing impossible to maintain and update the cumbersome system, which presented a growing problem for WERU. Radio stations are subject to many rules and therefore good scheduling and program archiving systems are necessary to manage shows and recorded audio content so it appropriately reflects and respects their schedule as well as copyright and syndication agreements. WERU is an affiliate of the Pacifica Network, which provides programming and required some detailed integrations to maximize its effectiveness for streaming online. RainStorm worked with WERU to create a modern, mobile-responsive website that enables visitors to learn not only about shows and access the station via online stream but also provides a wealth of access to other information. We created a set of WordPress plugins to pull show information out of the Pacifica system automatically on a schedule and bring it into custom post types inside the new WordPress site. Because there are specific rules about the length of time content can be on the website, the plugins mirror the information on the age of programming in the scheduling system and remove expired content at the right time. RainStorm modified a commercial theme to match the design and content presentation to meet WERU’s needs. Incorporated online donation tools to make giving easy. Now it’s easier than ever for WERU to maintain and manage their website and for people in Maine — and all over the world — to enjoy its unique programming.